A close, loving relationship between a father and daughter can be especially meaningful and rewarding. 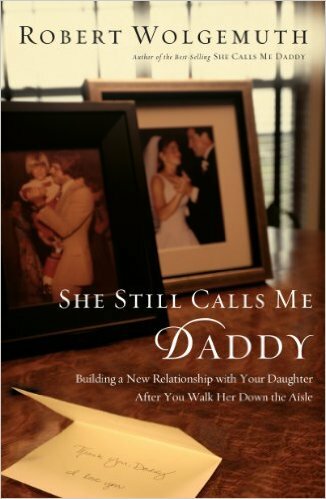 I readily admit that my latest read, She Still Calls Me Daddy: Building a New Relationship with Your Daughter After You Walk Her Down the Aisle by Robert Wolgemuth, is geared toward dads who have recently had a daughter get married. However, I was curious what the author’s take might be on giving his two daughters away in marriage. After all, I figured I could read it from the perspective of a daughter who has had a wonderful relationship with her father, not to mention seeing what might be in the future for my husband and our two girls. Wolgemuth uses the idea of remodeling a house as he delves into the building of a relationship with a married daughter and her husband. Chapters are devoted to the areas of protection, conversation, affection, discipline, laughter, faith and conduct. He includes lots of stories from his own experience, which make the information personal and interesting. I would have enjoyed seeing a few more practical tips on ways to develop and strengthen family connections in each of the areas he covered. My favorite chapter was the one on faith. The author uses the analogy of stirring ingredients together when following a recipe; in the same way, we as parents are to stir up the gifts that God has given to our children. God gives them “ingredients” or gifts; I, as a parent, am to do the stirring, “ those things that intentionally nurture and blend faith with everyday life.” He also includes great advice on praying for our children once they have left home and are married. While I enjoyed reading this book, I am guessing it will mean even more to my husband and myself when we reach this stage in our lives. From all that is detailed in the book, it certainly sounds like the author has built great relationships with his married daughters and sons-in-law. Thanks for posting your book reviews, btw. It's such fun to read what other people are reading and get ideas for what to read next.